Once your investor visa is granted, your spouse and unmarried dependent children under 18 can reside with you in Hong Kong. Should you become a permanent resident, your and your spouse’s parents over 60 can also apply for a dependent visa to come live with you. The scheme has a very short processing time: a typical application is granted in 2-3 months. You do not have to give details of your planned business activity, and you do not have to provide proof of any academic qualifications or previous managerial experience. Along with showing that you have the investment amount at your disposal, you also have to provide proof that you have the financial means to sustain yourself throughout your time in Hong Kong. You will not be allowed to work or receive public assistance in Hong Kong. You will be eligible for permanent residency after 7 years of temporary residency. Your Hong Kong residence permit gives you unrestricted entry rights on an unlimited number of occasions as long as the permit is valid. To qualify for Hong Kong investment residency, you have to invest at least HKD 10 million (USD 1.3 million) in one or a combination of the following: equities, debt securities, deposits, subordinated debt or collective investment schemes. 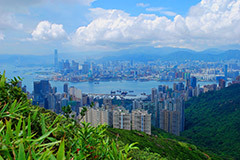 You will have to keep your investment as long as your residency in Hong Kong is valid. Should the value of your investment fall below the originally invested amount, you do not have to top it up. However, you are not allowed to withdraw any capital gains if the market value increases above the original amount.